Best Thermal Monocular of 2019 – Do NOT Buy Before Reading This! Pulsar is one of the most renowned brands in thermal imaging & hunting gear market. Their high-quality products and impeccable approach to manufacturing established them as a leader in the space. Their Helion line of thermal monoculars was always a well-recognized and well-received by buyers, and for a reason; they simply outperformed others, regardless if the product is used for hunting, surveillance, or search & rescue. The latest Helion XP50 (2.5 Version) is a crown jewel of Pulsar’s manufacturing & approach to modern thermal imaging devices. It comes jam-packed with features, it’s solid as a rock, rigid and waterproof, while being decently light and very convenient to use. Besides the 1800-yard detection range, 50Hz refresh rate is something that Pulsar products consider as a standard, and this feature really brings the fluid performance which is essential to precise usage & results at high distances. Combined with the integrated accelerometer, stadiametric rangefinder, 640x480 resolution with 17 µm details and a frost-resistant display, and a big, easy-removable battery you get the clear picture about this product’s quality. When talking about a product in this price range, you want all the tech gizmos to accompany the ruggedness & sheer quality, and Helion XP50 delivers. You get high-quality video recording & streaming, image recording of course, 8 color palettes to choose based on the environment and time of the day, and intuitive Stream Vision mobile app to enhance the control. But, as always, it’s not all sunshine & rainbows with XP50. The above-mentioned app is both iOS & Android friendly, but it lags & behaves quite strangely on the latter. (We didn’t test on iOS yet) Furthermore, you can’t access certain functions if you don’t use a mobile app, such as delayed snapshots. Simply said, there’s no perfect product. But for a thermal monocular, Pulsar Helion XP50 2.5 is really quite close. If you’re in the market for a high-quality thermal monocular and have money to spend, this is the one to get. 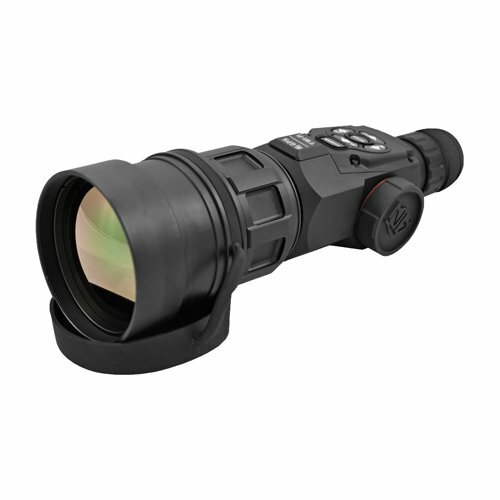 This monocular belongs to ATN’s range of thermal imaging cameras which boast of an OTS-HD Obsidian core processor. The hi-tech processor makes the monocular super fast and less lagging whether it's closing in on your prey or recording the entire experience. 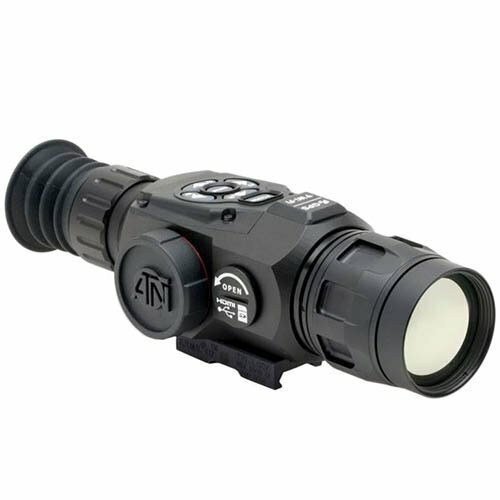 ATN OTS HD 384 thermal monocular features a compact lightweight design. Most of the inbuilt functions are controlled by a touch of a button. 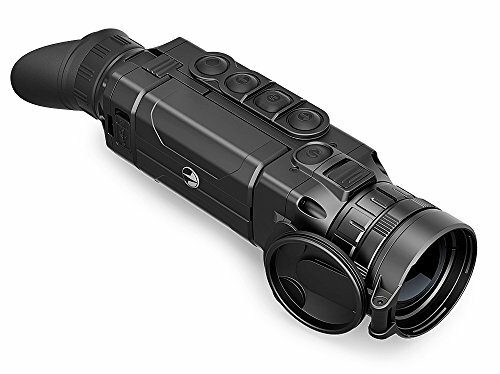 The monocular also comes with smart features to increase accuracy and reduce guessing while hunting. A built-in smart rangefinder allows you to bracket your target with two clicks and a shift of the scope. The reticle automatically adjusts to provide an accurate point of impact. In addition, a smooth zoom feature helps you close in on your subject with minimal lag. The ATN OTS HD 384 also comes with Bluetooth and Wi-Fi features. It connects to a smartphone or tablet via convenient ATN Obsidian mobile app. This allows you to connect to an even bigger screen and view the action both on the scope and mobile device. You can take HD images or record HD videos on the ATN OTS 384 thermal monocular. It has a 1080p video recording capacity while the obsidian core processor facilitates fast image capturing in hunting action. Speaking of fast image capturing, the device does come with sub-par refresh rate compared with other top-notch features. This means that a bit quicker movement will result in blurry, shaky footage. Same goes with magnification - everything beyond 50 yards will start to get pixelated & grainy. Furthermore, ATN’s customer support is not really effective - if you happen to deal with them, expect very pleasant conversation, but very long waiting times. Worth noticing when purchasing a product in this price range. Even before you look at its other features, the presence of a built-in smart rangefinder and a smooth zoom feature elevates the utility of this model to a higher level. Considering its flaws (which are minor, but noticeable) ATN OTS HD 384 is a quite good purchasing decision regardless in which position you’re in. First of all, FLIR Scout TK thermal monocular stands out due to its compact size, which makes it easy to store. Whether you are hiking through the woods or surveying your property, you can easily carry this monocular around since it only weighs 170g. It packs hi-tech specs that boost the performance in poorly lit environments. 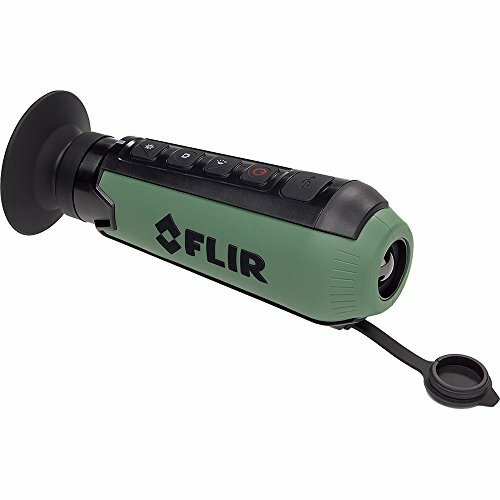 This is one of the best cheap thermal monoculars on the market. 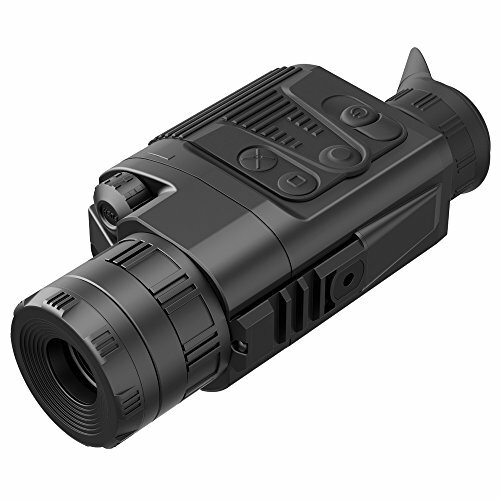 Scout TK thermal monocular is ideal for both indoor and outdoor applications. It allows you to spot hidden prey by switching to monochrome mode letting you distinguish the hot whites and cold blacks in any environment. This improves visibility in low-lit environments significantly, allowing you to spot the prey better. A built-in InstaAlert Feature facilitates quick spotting of prey in your hunting missions. The range, however, isn’t boast-worthy; quite the contrary, everything after 25-50 yards is basically unusable. Still, considering the price, it’s ok - you get what you pay for. The multiple-color settings are a good addition to this setup, and are appreciated; still, don’t expect much from them. FLIR Scout TK operates on Li-Ion rechargeable batteries that can give you 5 hours of undeterred surveillance. This feature is a bit exaggerated by the manufacturer, as this device won’t last as much. Furthermore, the battery can’t be user-replaced, so you have to carry a charger around, making it not as compatible. This is a handy little monocular, which can fulfill its purpose, which is short-range viewing & yard security. Its low price is one of its main pros, and it should be treated as such. Even it doesn’t have a plethora of functions or a long-lasting battery, it still brings value to the right person. And quite easily, you can be that person. Pulsar Quantum Lite thermal monocular (2.5-10×23) is a superb device when it comes to performance, features, & price-quality ratio. It comes in a rugged casing reinforced with fiberglass. This makes it tough and can withstand wear and tear even in the harshest conditions. The monocular is rubberized to improve its grip further. Pulsar Quantum Lite thermal monocular allows you to alter target viewing using 7 different color palettes. One of these colors is monochrome, which highlights hot areas with white and cold areas with black. This helps isolate the prey better even when hidden among thick bushes. A built-in stadiametric rangefinder allows the hunter to determine the distance from the prey. You can now increase your chances of hitting your target whether it’s a big deer or a small raccoon lurking in the woods. This monocular also comes with 50 Hz refresh rate, which maintains an accurate view of the prey regardless of whether you or the prey is in motion. Pulsar Quantum Lite has three operating modes; building, forest, and identification modes. The building mode enhances contrast in bright environments while the forest mode boosts contrast in poorly lit areas. Identification mode boosts contrast on hot areas alone providing better details of your prey. This makes it a very effective companion on lengthy night hunting sessions. Speaking of lengthy, Pulsar Quantum Lite night monocular uses AA rechargeable batteries which don’t last long, but can be swapped quickly. Furthermore, the Quantum possesses an automatic shut off mode, and a sleep mode to prolong the battery life while being completely responsive on the go - you won’t have to boot it up when you notice something. Similarly, this Monocular has three calibration modes, M, A, & H. M or manual mode silently adjusts the scope to avoid scaring your prey. A or automatic mode allows hands-free image calibration while H mode lets you decide when it is best to automatically calibrate the image. And now, the inevitable cons - which aren’t many. If you want record videos and share them via Wifi, you won’t be able to; this device doesn’t have each of these features. With its 7 different color palettes, a built-in stadiametric rangefinder and three operating modes for the price, it is of little amazement that the Pulsar Quantum Lite is one of the best-selling models out there. Starting with the best the ATN OTS-HD 640 has to offer, and its e-zoom settings come into play. It enables the device to focus on very distant objects; HD 640 has the power to increase its magnification from a meager 2.5x to a massive 28x (depending on which version of the monocular you buy). What’s more, since this unit runs on 4 AA batteries, it provides a considerable runtime of 8 hours on a single charge . ATN OTS-HD 640 comes with an upgradable firmware - that means you can update its antivirus at will. The firmwares is making this device so potent; it is suitable for a wide array of environments due to its 3D gyroscope and E-compass features. While the 3D gyroscope – by reducing hand shake – stabilizes the image and provides crisp, sharp images, the E-compass feature lets you navigate your way. More importantly, as we found out during our testing, using this product is effortless. ATN OTS-HD 640 has separate buttons for power switch, zoom increase/decrease plus a toggle as well. Equally impressive is the Smart Rangefinder feature, which allows this device to measure distances accurately. Next comes the E-zoom feature which gives it the freedom to focus on distant objects, but not at the cost of clarity - this monocular provides the crispiest zoomed output on the market. Turning our attention to the high-end features of this model, and its connectivity features come into play; Wi-Fi streaming mode, Bluetooth connectivity ensure synergy with modern devices which enrich the experience significantly. Speaking of experience, the following ATN companion app is iOS & Android compatible, making this device even more straightforward & intuitive to use. Granted, the field of view of this model isn’t that large. But it isn’t on the smaller side, too. In fact, in this price range, not many thermal monoculars could rival the features of the ATN. It is a modern, high-quality monocular that will make you a better hunter, guaranteed. 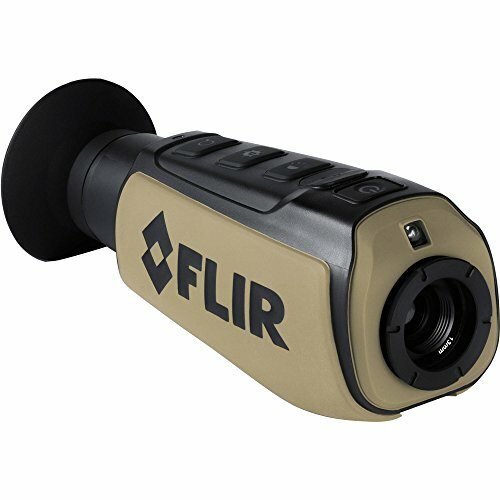 What is it that separates the Flir Scout III from other models in this review? For starters, its 1200-yard detection range (600-yard is its most effective zone), 640x480 LED screen and 240x180 thermal resolution – combined to give you high-quality detection. Furthermore, the Flir Scout III comes with a refresh rate of 30Hz which produces a crisp image. That said, it isn’t the market leader in this aspect, as Pulsar goes as far as to offer 50 Hz refresh rate in some of their similarly priced models. Moving on, this product provides a magnification factor of 2x and 4x and provides three different zoom settings in both 2x and 4x. Have in mind that these are provided by software, not hardware. It also gives you the freedom to choose from a wide range of detection palettes including White Hot, Black Hot, Insta Alert and Graded Fire). This is a decent feature set, as it proves to be one of the key-performing factors in hunting in low visibility. Scout III-240 provides two operation modes to give you the best picture for your environment. These include the E-zoom and color palettes described above. Have in mind that the E-zoom is a tech naming for an electronic (software) magnification, as this model doesn’t have a real zoom. Battery timing is another strong feature of this model. For, despite weighing a paltry 12 ounces, its manufacturer has managed to find space to pack this unit with a market-favorite Li-ion battery. That decision has paid dividends as this model comes with a 5-hour battery timing. Thanks to its increased resolution, compact design and a plethora of useful features, the Flir Scout III 240 is undoubtedly one of the best middle-class thermal monoculars out there. Go for this model if you aren’t deterred by its price tag. Thermal monocular devices are used by firefighters, law enforcement personnel, hunters, rescue workers and in various other fields. These devices detect the presence of humans and animals by mapping a heat signature. Many monocular models are available on the market, making it hard for you to narrow down to the one that is right for you. This guide lists the key factors that should affect your choice and help you find a monocular that fits your needs. The most important factor to consider when buying a thermal monocular is its intended use. Do you intend to use the device for nighttime (hog or other animals) hunting? Is the monocular intended for scanning the premises of your home to ensure security? Or is it going to be utilized for other surveillance and scanning purposes? Your intended use will determine what type of monocular will suit you best. For instance, a monocular for home security doesn’t need a significant detection distance. But when you are hunting outdoors and using a monocular, you will need a good detection distance in order to discern the target precisely. So you should determine the detection range, weight, magnification, resolution and other details of the monocular depending upon its ultimate usage. Ease of use is important when it comes to a thermal monocular. This is simply because you will potentially use the monocular in sensitive situations such as hunting, surveillance and home security. So, you want the device to operate easily and offer quick navigation. You may need to check out different models to see which one feels most intuitive to you. The ideal monocular will be one which has conveniently placed controls that are easy to manipulate and let you tweak the relevant settings quickly. The weight of a monocular device is a very important factor. When you are hunting outdoors for hours on end, a heavy monocular quickly becomes a burden. So if you intend to use the monocular extensively, you should go with a more light-weight model. However, you may need to compromise on this factor. Lighter monocular models are available but they often lack the advanced features that heavier models offer. So you may have to strike a balance between performance and weight in order to find a monocular that’s best-suited to you. Thermal monocular devices are typically used outdoors. This is why they must also offer good mobility. A monocular that can be easily carried around and stored is perfect for use during hunting, surveillance, home security and other purposes. In most cases, you may need to switch quickly from regular view to thermal scanning view in order to locate targets or potential threats. A monocular with good mobility allows you to make the switch with ease and speed. Mobility also ensures that the monocular can be carried and stored without spending a lot of time. The detection distance of a monocular is usually identifiable from its magnification power. A monocular with a larger magnification power can enlarge a distant shape or image to a greater degree. This enables you to see a distant image more clearly and discern more details. A smaller magnification power means that a monocular can enlarge and make clear an image over a smaller distance. So it has a smaller range of effective imaging. Have in mind the performance of the monocular when zoomed to the max; if a product you’re considering pixelates & blurs the image on max zoom, it is basically useless on that range. Always inspect the effectiveness & quality of the output a thermal monocular provides before purchasing. This would be most important for hunters, but not as much for home security. In many cases, you may want to store the imagery of a thermal monocular so that you can view and analyze it later. This is particularly the case if you use the monocular for surveillance purposes. Many monocular models come with support for mobile devices. Some even have an app that lets you directly stream the video from your monocular to a mobile device. This is immensely useful especially if you are going to share the monocular data across a group or with friends or colleagues who are remotely situated. It also allows you to stream the video and then store it on a device with sufficient internal storage space. Most thermal monocular models come with Forward-Looking Infrared (FLIR) sensors. These sensors come in different degrees of performance. The metrics that indicate a thermal sensor’s performance usually read like 640×480, 160×120 and 320×240. 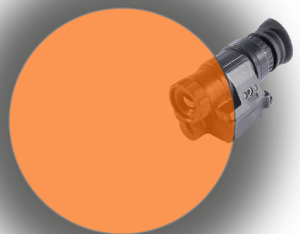 The thermal sensor is the most vital component of a thermal monocular. It is this sensor that detects the degree of heat emitted by various objects being viewed through the monocular. The sensor then maps and displays the heat signature of these objects in varying degrees depending on the amount of heat emitted. The great thing about thermal monocular models is that they come with both day and night vision modes. Thermal imaging relies on mapping the heat signature of a human or an animal in order to detect them. This signature is then displayed as an image so that you are able to detect their presence. This mapping can be effectively done by thermal imaging in light as well as dark conditions. You can choose a monocular that offers both modes or a model which offers the mode that you need. For instance, if you intend to use the monocular for nighttime hunting, you can settle with a model that only offers night mode. If you are going to hunt during day, in foggy conditions as well as at night sometimes, a model that offers both day and night modes will be more suitable. Color contrast is essential when you are viewing through a thermal monocular. It is the color contrast that lets you distinguish a heat-emitting object such as a human from a non-heat emitting object such as a wall or a stone. At the same time, a good color palette also offers distinction between objects with varying degrees of heat emission. The White Hot palette is most commonly used in FLIR thermal monocular models. This palette displays warm objects in different degrees of white, against a dark background. The resulting view is very realistic and allows you to discern the details quite precisely. The Black Hot palette reverses the image so that warm objects are shown in different shades of black against a white background. This is particularly useful for nighttime use. At times when the scene in front of you has a very low contrast, the Rainbow HC palette is the perfect choice. This palette uses a wide range of spectrum to display a thermal image with various colors. The warmer an object is, the deeper is the shade of red it is displayed in. This palette is useful if you want to see small temperature differences vividly. Yellow or Sepia is another color palette frequently offered in thermal monocular devices. This palette provides a contrast by using a yellow/black combination. Heat signature is shown in shades of yellow against a black background. This combination is particularly preferable if you are going to use the monocular for long stretches of time. If you want the warmer objects to stand out clearly without requiring too much object detail, Arctic palette is a good choice. This palette uses a clear outline to distinguish cooler objects from warmer ones. Because it uses shades of blue for coolness and a kind of orange shade for the heat signature, it is aptly named Arctic. You can choose a thermal monocular that offers a single or dual color palette. Alternatively, you also have the option of choosing a thermal monocular device that offers up to 7 color palettes. As a rule, the more color palettes you have, the better it is. This is simply because you are able to achieve good visibility and scanning in a diverse set of environments. Resolution is the clarity of the image displayed by the monocular to your eye. If the resolution is high, the image is clearer and there is more detail in it. If the resolution is lower, the image is less clear and may become even blurry in the case of very low resolutions. Typically, you should go with a monocular that offers higher resolution. However, exceptionally high-resolution monocular models can cost a tidy sum. So be sure that you don’t go for the highest resolution, but a resolution that is high enough to serve the purpose for you. Thermal monocular resolution is usually denoted as 320 x 240 or 640 x 480. The power source of a monocular is an important factor. If you are going to use the monocular outdoors for many hours on end, you need a battery that can power up the monocular for so long without requiring a recharge. Monocular models usually come with rechargeable batteries or Lithium-ion batteries. You can choose between the two depending on your specific needs. Monocular models that can run continuously for a longer stretch of time without requiring battery recharge or replacement typically cost more. You can circumvent this by choosing a device with rechargeable batteries or carry back-up batteries for emergency usage. The thermal monocular that is a good fit for you depends entirely on your needs and requirements. You must clearly identify why you need the monocular and what do you intend to use it for. Once these questions are clear, it will be a lot easier for you to make the right choice. There are many different types of designs when it comes to thermal monocular devices. The most commonly used is the handheld monocular. This type of monocular is equally popular with hunters and outdoor enthusiasts. Handheld monoculars are typically compact and nifty devices which can be easily carried around. They are also lightweight and do not become a burden. Handheld monocular devices also cost low most of the times. On the downside, handheld monocular devices are a significant hassle if you have to use them for extended periods. For instance, if you are doing surveillance on a building or a person and need to continuously use the monocular, it can become very tiring. Storage of a handheld monocular can also be a slight problem. You can hang it from your neck like a chain or keep it in your pocket but in either case, you need to be careful about it especially if you are doing any physical activity such as running. Another type of thermal monocular devices is the head-mounted devices. As their name suggests, these devices are used in combination with a headgear so that they are mounted entirely on the head. You can use a quick switch to bring them in front or to remove them from the eye level. However, you don’t have to hold the device or use your hands for operation. The overwhelming benefit of a head mount monocular is that it frees up your hands. You can use your hands for carrying or operating other objects, performing physical activities such as holding a weapon or climbing a wall, or for other purposes. At the same time, the headgear keeps the monocular mounted with stability at the right eye level, giving you a steady thermal image. When mounted on a headgear, you also don’t have to worry about the storage of the monocular device. A head-mount monocular is particularly useful if you are going to use the device for extended stretches of time. For instance, if you walking and scanning at the same time, or if you are performing surveillance and need to engage with a person at any time, the head-mounted monocular provides continuous surveillance while also allowing the freedom to multi-task. On the downside, a head-mount thermal monocular usually costs more. You have to pay not just for the monocular but also the headgear equipment. It is also somewhat of a hassle to wear the headgear and you have to be careful not to damage the headgear or the monocular mounted on it. The type of thermal monocular you decide to use is determined by your personal preferences and how you intend to use it. Whether you are hunting or simply surveying your environment, a good monocular should work well in both well-lit and poorly lit environments. In addition, the best thermal monocular should easily zoom in and out even when in motion. Consider working with a lightweight monocular that you can carry around easily wherever you go without weighing you down. If you want the best of the best, the overall winner is definitely the Pulsar Helion XP50 2.5 Thermal Monocular. The sheer power & accuracy it brings are simply too good compared to everything else on the market. Its only real flaw can be easily surpassed by updating the software of the app, and synchronising with the smartphone. In both range, clarity, responsiveness, refresh rate, usefulness, ruggedness & durability, and overall value, this monocular is the best one to get.